Shares in Toyota have hit their lowest level for 10 months on the Tokyo Stock Exchange with continuing concern about the safety of the company's vehicles. The world's biggest carmaker has recalled 8 million vehicles globally because of problems with defective accelerator pedals on seven models. It is also investigating reports of faulty brakes on its Prius hybrid car. Analysts say the lost sales and repairs could cost Toyota $2bn (£1.3bn). It is due to report quarterly earnings later. 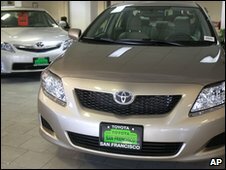 At a Congressional hearing on Wednesday, US Transportation Secretary Ray LaHood alarmed both investors and consumers with the advice, which he later retracted, that owners of a recalled Toyota should "stop driving it". He later said: "What I said in there was obviously a misstatement. What I meant to say... was if you own one of these cars or if you're in doubt, take it to the dealer and they're going to fix it." Mr LaHood vowed that in the meantime his department would "continue to hold Toyota's feet to the fire to make sure that they are doing everything they have promised to make their vehicles safe". He also repeated that they were studying the possibility of civil penalties against Toyota for safety violations, which could mean fines of millions of dollars. Both he and his Japanese counterpart have ordered the company to investigate complaints of brake problems with the Prius and have not ruled out a recall. Toyota spokeswoman Ririko Takeuchi has said it is aware of 77 complaints about the hybrid in Japan, and about 100 in the US. A day after falling 5.7%, Toyota shares fell a further 3.5% on the Tokyo Stock Exchange on Thursday morning and hit their lowest level for 10 months. 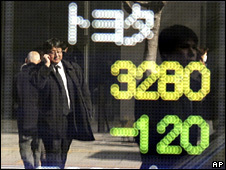 US-listed Toyota shares ended Wednesday trading down 6% or 4.69 cents to 73.49 cents, continuing the falls of recent days. The TSE shares have now lost about 22% of their value, or some $30bn, since 21 January, when the company announced the recall of some 2.3 million vehicles in the US amid concerns that their accelerator pedals could become stuck. It is also recalling up to 1.8 million cars across Europe, including 180,865 in the UK. The seven models being recalled in Europe are the Aygo, iQ, Yaris, Auris, Corolla, Verso, and Avensis, and cover manufacturing dates going back to February 2005. 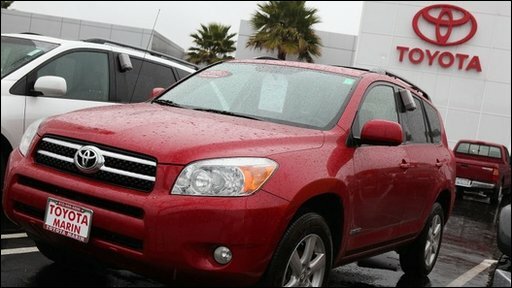 In the US, they are the RAV4, Corollas, Matrix, Avalons, Camrys, Highlander, Tundra, and Sequoia, and cover dates going back to October 2005. The parts needed to repair the cars will not arrive in the UK until next week, with the first repairs scheduled for Wednesday. Toyota says the process, which should only be carried out by its dealers, takes around half an hour. The carmaker said it was not aware of any accidents resulting from the issue and that only 26 incidents involving accelerator pedals had been reported in Europe. Last year, Toyota was forced to recall about 5 million cars worldwide over problems with floor mats trapping pedals. All eyes are now on its third-quarter results announcement later in Tokyo, at which it is widely expected to reduce what most analysts deemed an excessively conservative operating loss forecast of $3.85bn. Before Toyota expanded the vehicle recalls last month, analysts had expected a return to profits in the next financial year.